This article isn't quite for beginners. If you are new to Webpack or Gulp, perhaps start with these tutorials. Check the demo repo on GitHub. The branch "hmr" shows how to set up Hot Module Reloading. As of Node v7.9.0, ES6 modules are not supported, that is why we install Babel to make use of import statements and other cutting edge JS features in our tasks. If you don't need HMR, feel free to leave Hot Middleware out of the packages listed above. The Dev Middleware does not depend on it. Let's get started! Create a tasks folder in your project root with three files: index.js, webpack.js and server.js. We have less clutter in our project root since the index file acts like gulpfile.js and the webpack file as webpack.config.js . "build": "NODE_ENV=production gulp build --require babel-register --gulpfile tasks"
The babel-register command processes the import statements and the --gulpfile flag defines the path to gulpfile.js or, in our case, index.js . We only need to reference the tasks folder because like in HTML the file named index marks the entry point. Notice how we don't export the object directly like many tutorials show but put it into a variable first. This is necessary so we can use the configuration in the Gulp task scripts below as well as in the server middleware in the next step. The config.context setup is necessary to set all paths relative to our site folder. Otherwise they would start from the tasks folder which could lead to confusion down the road. If you have a very long Webpack config, you can also split it and the task into two files. Make sure to disable the extra entries and the HMR plugin for production. The package Webpack Merge helps setting up different environments for development and production. The Dev Middleware enables BrowserSync to process what was defined as entry in webpack.js. To give it this information we import the config module. Hot Middlware on the other hand checks for changes in app components like `.vue` files for Vue.js to inject. Since we cannot hot reload files like main.js, we watch them and reload the window on change. Again, if you don't need HMR, remove webpackHotMiddleware. The exported variables define what tasks to run under which command. The default export runs with gulp. If you separate development and production environments for Webpack, you might want to run a gulp build task which makes use of production options. For that, we import the scripts tasks on its own since we don't need to start the server here. During development, Webpack is run by BrowserSync so putting the scripts task in the dev command is not necessary. To start developing you cannot just run gulp or gulp build since it will look for a gulpfile.js in the project root. We have to run the npm commands npm run dev and npm run build to make use of the defined flags. Now you can imagine how easy it is to expand and write more tasks. Export a task in one file and import it in `index.js`. Clean and easy to maintain! 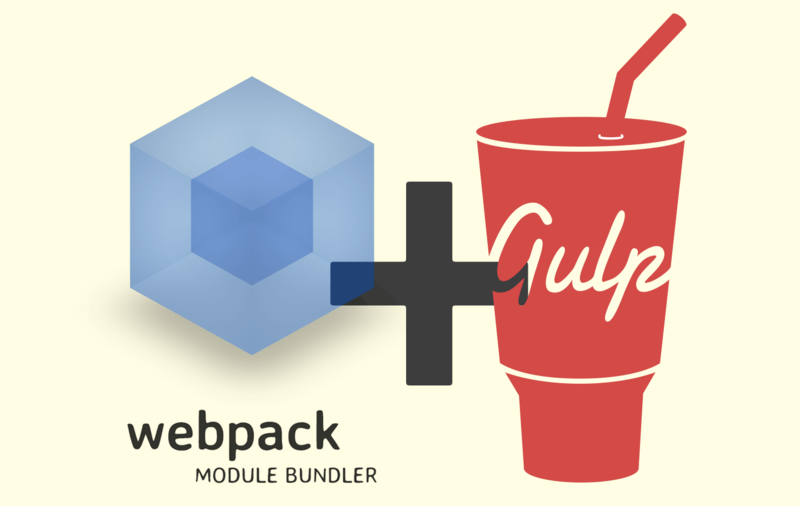 Again, why use both Webpack and Gulp? Gulp can handle static assets better than Webpack. The Copy Webpack Plugin can also copy files from your source to your build folder but when it comes to watching file deletion or changes like overriding an image, gulp.watch is a safer bet. As seen in this post on GitHub Sass gets processed by node-sass much quicker than by Webpack's combination of sass-loader, css-loader and extract-text-webpack-plugin. Thanks author for the example and description. That’s why I decided to get this way. Further, the webpack configuration here for hot loading is a lot more complex than required. You don’t need to add entry files for hot loading, just set devServer.hot to true. Gulp can handle static assets better than Webpack. Again, I’m going to have to disagree. Static asset management in webpack is a lot more powerful than using gulp, especially when you understand loaders. Using the html-loader, for instance, will automatically use webpack loaders for referenced static files in the HTML (images, etc). If you don’t want to inline files, just use file-loader and then you get the added benefit of a failing build if webpack can’t find an asset, e.g., you deleted an asset and maybe forgot a reference. You lose that if you don’t let webpack manage your static assets. Not to be a Debbie Downer, but combining Webpack, Gulp, and Browsersync just makes everything much more complicated than it needs to be. I would personally just use webpack. If you need more features from Browsersync (like syncing user events between browsers, what it was originally designed for) then there’s a browsersync plugin available for webpack. If you prefer a more traditional setup then just use Gulp and Browsersync. Trying to combine everything together just creates a fragile setup that’s hard to update. Hey Ken, I recently migrated from grunt and webpack 1 to NPM commands and webpack 2. And I have to admit I feel some of Pascal’s pain. It seems like my compile time is longer than before. Also, we run our development site out of our dist folder, but this causes issues when we change a .json file that contains our resource string as that file doesn’t get automatically copied to the dist folder. Do most projects avoid this by serving from their app folder? Or is there another plugin I’m missing. Concepts like this seem to be a little more straightforward with grunt/gulp. I’m using Webpack every days and I love it but it’s still 100 times more complex to understand, setup and tweak than is Gulp or Grunt. Also most of the Webpack boilerplate out there don’t handle static assets optimisation like images optimisation, sprite generation, etc. It seems that the community lost that in the switch between Grunt/Gulp and Webpack for some reason. I set them up with Webpack and it was a real pain to do so, so I understand why it can be useful to have Gulp in parallel for these. Chris recently discussed the issue of dependencies (see comment on this page https://css-tricks.com/projects-need-react/), and I think it bears repeating. In order to even start to use webpack, for example, you need to commit to a whole series of technologies. I don’t think the issue is what the list is (if I say “node.js” you may well reply that you like node.js), the issue is the fact that the list makes one commit to an entire, elaborate style of workflow — compiling resources, running local servers, package managers, etc. This all feels very much to be a computer-science driven way of thinking about development: emphasizing abstraction and streamlining and tools. But this way of thinking has proven to not be good for the web, where things need to be practical, seat-of-your-pants, and forgiving. HTML5, in my mind, was a backlash to this overengineering and a return to the more “blue collar” way of seeing the web: it’s an inefficient, always in motion, spaghetti, hack world, but it is all simple — text files and urls at base. Simultaneous to this move towards increasing dependencies and compilation is this attempt to make WordPress become part of the “stack” — part of the infrastructure like apache, PHP, MySQL, etc. If you look at the code for this site, for example, you’ll see many JS files loading all over the place, often dynamically written — many of which, at first glance, seem devoted to variously “optimizing” the site. I see an SEO module, there always tons of google scripts, twitter scripts, FB scripts, etc. If webpack et al are meant to somehow streamline delivery or make the organization of assets easier, then there seems to be some sort of disconnect somewhere. More and more often I see WP sites that load dozens of plugins that no one understands or keeps track of; I see developers blindly pasting “build” and “install” into their consoles, installing more and more alpha- or beta- server plugins, and leaving abandoned complex frameworks everywhere, deeply tied to their impossible-to-understand code. Cruft is building up more and more — and not the kind of cruft that HTML5 tried to solve by allowing messiness. Things are not getting streamlined or simplified. The proliferation of middleware web development tools is a big fat stinky mess. Is Gulp 4.0 safe to use now? It’s been in beta for absolutely ages, to the point that I was wondering if all the devs had abandoned it in favour of WebPack. It’s part of my workflow for over half a year now. Is the name of BrowserSync task file different than webpack.js? Shoot, you are right. Thanks! The BrowserSync task would be in server.js, not webpack.js. I’ll contact an admin about that.